It's March 10th. To be able to call it spring already means something has happened with winter! In the last update (you can recap here if you need as I'll be referring to it a little) in early December, I talked about how winter had arrived at last. Well, it would appear it didn't fancy staying around for long! Not only did we not actually have a white Christmas this year, but when the snow did properly come in January, and temperatures dropped to their normal -20c, by February we hit zero again, and now in March, all the snow has long gone, and temperatures are picking up. These two photos were taken over the weekend just gone. It's beautiful. Dare we believe spring really is upon us - maybe. It's two years since we arrived in Tallinn, which was on 1st March 2012. Then, in April, it snowed. But it was already snowy in the March. So we'll see soon enough. What is funny, was that in the last update we talked about Rebekah who was joining us in February "the coldest month" and please pray for her to settle. As you'll find out in this update, both prayers were very much answered! 'Christianity Explored' course starting this week! In December I took the guys from our core team to Russia to serve two churches in St Petersburg. It was great for the team to spend time together, as well as to work together in the settings we found ourselves in. On the Friday night, we spent time with some friends at a coffee shop, one of the best in the city. I'd love them to think about opening a similar venue in Tallinn. We'll see! On Saturday, we served at a Russian church called Open Heaven church. I spoke for about 25 minutes (plus translation) and then the team got to share words etc. Two hours later we were only just leaving, having prayed with lots of folks, which seemed to go well. On the Sunday I took them to Hope Church, where I spoke again and the team shared words and we prayed for people after. We were the last to leave again, walking with a group of the leaders from the church to the offices, where we were going to eat together and pray for them. We did that over about two hours, hanging out there long after the crowd had left, as another friend dropped in and we spent time all talking together. That left time to eat together as a four before all getting the lunchtime bus home on the Monday, back in Tallinn at around 7 that night. A busy but worthwhile trip. It was good for Hope church in St Petersburg to be able to make a wider connection (beyond me and Rachel) with the team in Tallinn, and also for the team here to see something of the history and connection with Hope Church. On the 26th February, Rebekah Wisbey landed in Tallinn, the latest addition to team Tallinn. As well as the favourable weather she has found since arriving, another remarkable answer to prayer is how quickly she has settled in. She stayed with us for her first two nights, but did get her keys to her own flat on the second day, a place that up to that point, only Rachel had actually seen. She is now settled there, still not used to waking up and seeing the sea (which is right in front of her building!). Since the beginning of January, we've also had three YWAM workers, in Tallinn for 3 months, joining us. Milena (a German lady), Stephanie (an English lady) and Daniel (an English guy) who have all been a great help, the two girls also able to get involved with the Thursday morning toddler group, which we'll come to in a moment. It's had the effect to boost the numbers - a core currently at 11, if not all permanent people. It has made a big difference though. We're enjoying the extra bodies! If it's right that any of them stay on after (which is a possibility, but they'd need God to make it very clear!) we'd be delighted! The connection with YWAM has been positive, and as well as these three, there have also been two teams through Tallinn in the last month or so, bringing more people to the different events. And sometimes crowds draw a crowd. For a long time, we've had the aim to run an Alpha style course as a stepping stone for many people in the crowd we've gathered to have a place to explore a little deeper together. A full 12 week Alpha course was a little too much at the moment we felt - both for the small core team, as well as for our guests. Many are business people who would miss many weeks through travel. We'd been recommended the Christianity Explored course, which goes a little slower than all that Alpha covers, and in seven weeks, worked with our timing. 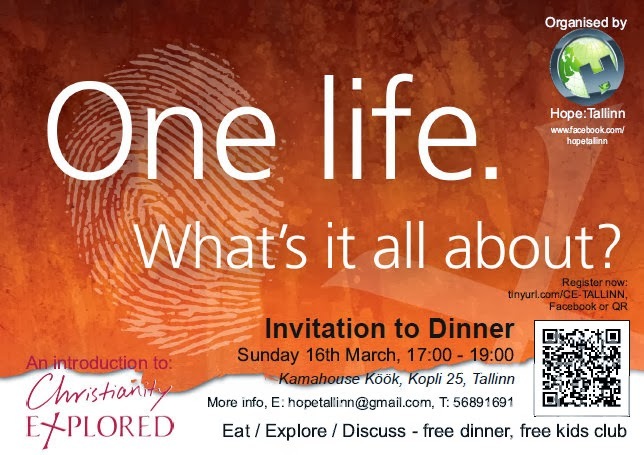 So we are launching this course this coming Sunday, 16th March, in Tallinn. We wanted a venue to host this one - aiming to find somewhere catered, that allowed space for a separate area for children. With Rebekah arriving, we at least had the right person to head up the care for the children. But where to find the venue. Would we find favour working in our situation? Well, a church leader was passing through Tallinn, and I was meeting him one lunchtime with Arnoud. We were due to go to a restaurant on the other side of town near to where Arnoud works, so as to be able to maximise his lunch break. It so happened that the day before Arnoud had been a little unwell, so was instead working from home the day this meeting was to happen. We therefore had the option of going somewhere much more local, and Arnoud had been recommended a place near by, in the part of the city we both live in. It was whilst having lunch, that we spotted on the menu the facilities that were available to rent. Soon we were speaking to the owner, having a good look around, and feeling very excited. Just a couple of weeks later, all our seven dates are booked and we start this weekend! The venue offers excellent food, and space for adults to eat together, with another area where Rebekah and her team can run a kids club. It was a real breakthrough and real favour. You can even check out the restaurants Facebook Page as they too are advertising our event to their 3200+ followers! Needless to say - please pray for us with this event. It represents a huge leap for us, but done in an appropriate way. The catering is taken care of, and the talks will be done from the DVD, so the teams focus can be on the discussion and relationships element. So far we have about twenty signed up, which includes around eight guests. I've picked up on the word favour above because when I was in Holland in October, there was a prophecy over us in relation to breakthrough, and while it started with finances, the main emphasis was in relation to favour. Is this yet another example of the outworking to that word? Last Thursday, at the regular weekly toddler group, there were 33 people in total! This is the most we've ever had! The breakdown was 16 adults and 17 children. It must have been approaching a dozen nationalities. It was so busy, that Rachel had not realised I was not there at the end - having gone off midway through to meet someone in town. Running late for the bus, finding my coat proved a little hard, as it was TEN deep on the coat rack....I think I need to plan for this in the future, keeping my coat with me if I need to leave before anyone else! Rachel took a photo of some of the coats, though this doesn't even tell the whole story. And on Sunday, at the monthly meal, we had even more people - 34 this time! Only about 10 of these where children, and of the two events, only about ten people where at both. Needless to say, it was a little busy, and having arrived before 5, the last people were not leaving until 8:30, when the cleaning could begin! We are so thankful that God has given us a flat with enough space (just about) to fit in all these people at the same time. Invites for next Sunday were given to folks at both events, and I even made a public announcement at the meal yesterday, but it remains to be seen exactly how many people will come to the event next weekend. Though life is often busy, and visitors to our home are plenty, we are all doing well, and trying our best to get a sensible balance between these two worlds, as overlapping as they are. Anya turned 4 at the beginning of the month, and had a little party to celebrate the fact. As her birthday fell on a special day in Estonia, she got to ride on a horse and cart at her kindergarten, which was hired as part of their celebrations. An extra special treat! Mia is continuing to do well at school, and has a little less commitments as we've made her have a break from ballet this term, much to her own disappointment at the time, but she understands it - and enjoys it all now. We'll look to get her started at a new ballet later this year. I also managed to surprise my mum for her 70th birthday, flying back to the UK for the weekend at the beginning of March, turning up on her doorstep to her surprise. All the family knew, my mum aside, so the details worked out well. It was nice to have been able to be a part of it all, even if it meant I missed Anya's own birthday party - I was back in time for her actual birthday, which was a lovely day as well. Since the last update, things have gone really crazy with my writing side. Approaching the end of January, I was slowly approaching 200 likes on my official Facebook page. The readership of my one published novel was in the 100-200 bracket. Reaching the 200th 'Like' triggered a special promotion, which ran for three days on Amazon over the last days of January. In those 72 hours, there were 2,566 downloads of my novel, and in the month of February, more sales than all the previous months, combined. At the height of the downloads, Cherry Picking stood at #2 on the UK Mystery Chart with Amazon, and #6 on the All Books chart! By the end of February, my Page stood at over 1,100 likes, an increase of 900 in one month! My new novel is also approaching its final stages. Over 100,000 people saw my page as I asked fan's advice about cover designs for the two books. Is this another sign of favour coming my way - not to mention breakthrough! And a final off shoot of this was being contacted by Amazon themselves, who are discussing enrolling Cherry Picking into their Daily Deals program (a huge honour!) because, according to their message, my book "had come into view and they thought it could do really well if selected for the promotion." It remains to be seen what will come of this. I've also had another publishing company contact me, also stating they were impressed and wanting to know if I'd be interested in working with them. Is this favour or distraction - or something else? I guess only time will tell for sure. But with my new novel set to come out later this year (I hope! ), and a readership approaching 3000 people now, its a great platform for launching the new book onto, so I'm excited by what might come of it all. Because last time around, we talked about needing breakthrough. And while none of this mentioned above physically represents that (yet - as exciting as it sounds), we are still in that place of not fully knowing what the future needs to look like. No job options have yet come up for me. Not even one interview. The record book sales of February, are not continuing in that pattern for March. God did do some extraordinary things in December, so that things are a lot calmer financially at the moment, for a few months. We are so thankful for that. But still the medium term solution is unsure. Does this look like more work locally? Will this be even greater breakthrough in book sales and the like? Is it something else entirely? We do not know - but we ask you to pray. And pray all the more. It came to light yesterday at the meal, that while in the UK my part time job is under the tax limit, so not subject to payment, in Estonia this is chargeable - as is all charitable giving we receive! And while I was ignorant of that before, now aware of it, it's a situation that is a little concerning, but also one we need to resolve. It seems gutting that while our UK support was not 'acceptable' by the Estonian banks (meaning we were penalised and put onto a much higher interest rate mortgage), this same income source is acceptable to the tax office! Potentially losing a big percentage of this 'income' to tax is another little issue for us. But praise God he is the God of breakthrough - and favour! For wisdom regarding the growing events - space and numbers are becoming an issue! Thanks for reading. Sorry it's been such a long time since we've updated you all.